Stars Are Listed By Star Classification. Star classification is the classification of stars. In astronomy, star classification or stellar classification is a classification of stars based initially on photospheric temperature and its associated spectral characteristics, and subsequently refined in terms of other characteristics. Stellar temperatures can be classified by using Wien's displacement law; but this poses difficulties for distant stars. stellar spectroscopy offers a way to classify stars according to their absorption lines; particular absorption lines can be observed only for a certain range of temperatures because only in that range are the involved atomic energy levels populated. An early scheme (from the 19th century) ranked stars from A to Q, which is the origin of the currently used spectral classes. This stellar classification is the most commonly used. The common classes are normally listed from hottest to coldest (with mass, radius and luminosity compared to the Sun) and are given in the following table. The colors in this table are greatly exaggerated for illustration. The actual color of the listed stars is mostly white with a very faint tint of the color indicated; often stars' colors are too subtle to notice and may be affected by their proximity to the horizon (from the perspective of the observer). The sizes listed for each class are appropriate only for stars on the main sequence portion of their lives and so are not appropriate for red giants. A popular mnemonic for remembering the order is "Oh Be A Fine Girl, Kiss Me" (there are many variants of this mnemonic). This scheme was developed in the 1900s, by Annie J. Cannon and the Harvard College Observatory. 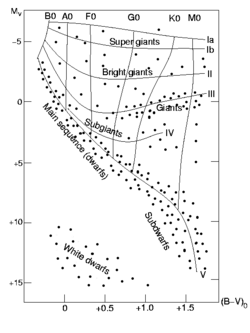 The Hertzsprung-Russell diagram relates stellar classification with Absolute magnitude, luminosity, and surface temperature. While these descriptions of stellar colors are traditional in astronomy, they really describe the light after it has been scattered by the atmosphere. The Sun is not in fact a yellow star, but has essentially the color temperature of a black body of 5780 K; this is a white with no trace of yellow which is sometimes used as a definition for standard white. The reason for the odd arrangement of letters is historical. When people first started taking spectra of stars, they noticed that stars had very different Hydrogen spectral lines strengths, and so they classified stars based on the strength of the hydrogen balmer series lines from A (strongest) to Q (weakest). Other lines of neutral and ionized species then came into play (H&K lines of calcium, Sodium D lines etc). Later it was found that some of the classes were actually duplicates and those classes were removed. It was only much later that it was discovered that the strength of the hydrogen line was connected with the surface temperature of the star. The basic work was done by the "girls" of Harvard College Observatory, primarily Annie Jump Cannon and Antonia Maury, based on the work of Williamina Fleming. Spectral classes are further subdivided by Arabic numerals (0-9). For example, A0 denotes the hottest stars in the A class and A9 denotes the coolest ones. The sun is classified as G2. Spectral types of stellar classification. The following illustration represents star classes with the colors very close to those actually percieved by the the human eye. The relative sizes are for main sequence or "dwarf" stars. Class O stars are very hot and very luminous, being bluish in colour; in fact, most of their output is in the ultraviolet range. These are the rarest of all main sequence stars, constituting as few as 1 in 32,000. (LeDrew) O-stars shine with a power over a million times our Sun's output. These stars have prominent ionized and neutral helium lines and only weak hydrogen lines. Because they are so huge, Class O stars burn through their hydrogen fuel very quickly, and are the first stars to leave the main sequence. Recent observations by the Spitzer space telescope indicate that planetary formation does not occur within the vicinity of an O class star due to the Photo evaporation effect. Examples of Stellar classification: Zeta Puppis, Lambda Orionis. Examples of Stellar classification: Rigel, Spica, the brighter Pleiades. Class G stars are probably the best known, if only for the reason that our Sun is of this class. They have even weaker hydrogen lines than F, but along with the ionized metals, they have neutral metals. G is host to the "Yellow Evolutionary Void". Supergiant stars often swing between O or B (blue) and K or M (red). While they do this, they do not stay for long in the G classification as this is an extremely unstable place for a supergiant to be. These are about 8% of all main sequence stars. Class M is by far the most common class. Over 78% of stars are red dwarfs, such as Proxima Centauri (LeDrew). M is also host to most giants and some supergiants such as Antares and Betelgeuse, as well as Mira variables. The spectrum of an M star shows lines belonging to molecules and all neutral metals but hydrogen are usually absent. Titanium oxide can be strong in M stars. Class W or WR represents the superluminous Wolf-Rayet stars, notably unusual since they have mostly helium in their atmospheres instead of hydrogen. They are thought to be dying supergiants with their hydrogen layer blown away by hot stellar winds caused by their high temperatures, thereby directly exposing their hot helium shell. Class W is subdivided into subclasses WN and WC according to the dominance of nitrogen or carbon in their spectra (and outer layers). Class L, dwarfs get their designation because they are cooler than M stars and L is the remaining letter alphabetically closest to M. L does not mean Lithium Dwarf; a large fraction of these stars do not have lithium in their spectra. Some of these objects are of substellar mass (do not support fusion) and some are not, so collectively this class of objects should be referred to as "L dwarfs", not "L stars." They are a very dark red in colour and brightest in Infrared. Their gas is cool enough to allow metal hydrides and alkali metals to be prominent in their spectra. L: 1,300 - 2,500 K - Dwarfs (some stellar, some substellar) with metal hydrides and alkali metals prominent in their spectra. Class T and L could be more common than all the other classes combined, if recent research is accurate. From studying the number of proplyds (protoplanetary discs, clumps of gas in nebulae from which stars and solar systems are formed) then the number of stars in the Galaxy should be several orders of magnitude higher than what we know about. It's theorised that these proplyds are in a race with each other. The first one to form will become a proto-star, which are very violent objects and will disrupt other proplyds in the vicinity, stripping them of their gas. The victim proplyds will then probably go on to become main sequence stars or brown dwarf stars of the L and T classes, but quite invisible to us. Since they live so long, these smaller stars will accumulate over time. Class Y stars, (ultra-cool dwarfs), are much cooler than T-dwarfs. None have been found as of yet. Originally classified as R and N stars, these are also known as 'carbon stars'. These are red giants, near the end of their lives, in which there is an excess of carbon in the atmosphere. The old R and N classes ran parallel to the normal classification system from roughly mid G to late M. These have more recently been remapped into a unified carbon classifier C, with N0 starting at roughly C6. The class D is sometimes used for white dwarfs, the state most stars end their life in. Class D is further divided into classes DA, DB, DC, DO, DZ, and DQ. The letters are not related to the letters used in the classification of true stars, but instead indicate the composition of the white dwarf's outer layer or "atmosphere". DO: an ionized helium-rich "atmosphere" or outer layer, indicated by ionized helium spectral lines, (He II lines). DAV or zz Ceti: a hydrogen-rich pulsating white dwarf. DBV or V777 Her: a helium-rich pulsating white dwarf. DOV or PG 1159: a helium-rich pulsating white dwarf. VII white dwarfs (rarely used). Stars can also be classified using photometric data from any photometric system. For example, we can calibrate colour index diagrams UB,BV in the UBV system according to spectral and luminosity classes. Nevertheless, this callibration is not straightforward, because many effects are superimposed in such diagrams: metallicity, interstellar reddening, binary and multiple stars. The more colours and more narrow passbands in photometric systems we use, the more precisely we can derive star's class (and, hence, physical parameters). The best are, of course, spectral measurements, but we not always have enough time to get qualitative spectra with high signal-to-noise ratio.